you can find at Natural Landscapes of the World section of our site. 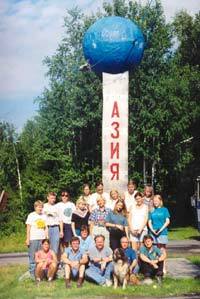 Next year after our US educational trip, summer 1998 Association Ecosystem hosted the group of American educators in Russia. All these people werу friends and students of our last summer leader Michael Brody - the professor of Montana State University, Bozeman (USA). The goal of their visit to Russia was carrying out a few pedagogical workshops in different Russian regions - Kemerovo (Eastern Siberia), Nijniy Tagil (Ural) and Moscow. 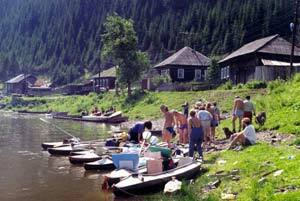 Being in the Ural mountains we seized on the idea of rafting on the canoes by Chusovaya river, one of the famous and beautiful rivers in the Ural. 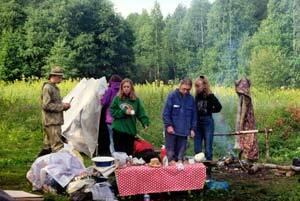 Picture on the left shows our expedition group on the Europe-Asia border, not far from the Chusovaya river. The leaders of our expedition were from Nijniy Tagil city - Vladimir Zikov, who was a young tourist center teacher and Lidia Vavaeva from Young Naturalist Station . 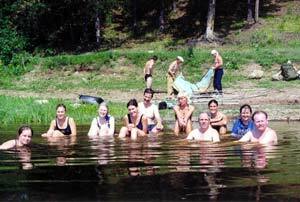 These our friends arranged everything necessary for the expedition: canoes, tents, slipping baggs, food, and even bodyguard ! 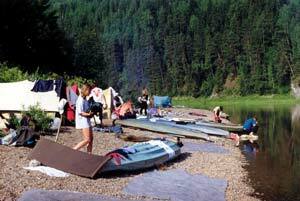 It was a real expedition: all were separated by pairs, one Russian and one American and each pair work together - live in one tent, was on duty at the camp, paddle in the canoe. 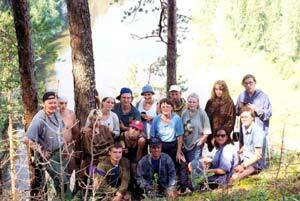 It was a real international expedition - every Russian-American pair was on duty. Rafting down the river we stopped often to climb the nearest bald, making a picture of local plant and trying to identify local rock or mineral. Remember, there were not ordinary rafters, but biologists and geographers in their professional atmosphere ! Picture on the left shows us on the Kamen peak - the local "mountain navel", 1200 above sea level. We were lucky with the weather - the sun was shining and the water was warm. The picture on the left shows the workshop "The approaches and methods of ecology and environmental education in US and Russia: comparative analysis". Lecturers: the professor of Montana State University Dr. Michael Brody, USA and the president of Ecosystem Association Dr. Alexander Bogolyubov, Russia. Tired but happy, sting by mosquitoes and lost flesh (therefore) we landed near small local village Kin. We were met by wondered local citizens, the most of them have heard English language in their wild places at first time in their life. Farewell!, Chusovaya, see you later (maybe...).